Publicity is justly commended as a remedy for social and industrial diseases. Sunlight is said to be the best of disinfectants; electric light the most efficient policeman. And publicity has already played an important part in the struggle against the Money Trust. The Pujo Committee has, in the disclosure of the facts concerning financial concentration, made a most important contribution toward attainment of the New Freedom. The battlefield has been surveyed and charted. The hostile forces have been located, counted and appraised. That was a necessary first step—and a long one—towards relief. The provisions in the Committee's bill concerning the incorporation of stock exchanges and the statement to be made in connection with the listing of securities would doubtless have a beneficent effect. But there should be a further call upon publicity for service. That potent force must, in the impending struggle, be utilized in many ways as a continuous remedial measure. Combination and control of other people's money and of other people's businesses. These are the main factors in the development of the Money Trust. But the wealth of the investment banker is also a factor. And with the extraordinary growth of his wealth in recent years, the relative importance of wealth as a factor in financial concentration has grown steadily. It was wealth which enabled Mr. Morgan, in 1910, to pay $3,000,000 for $51,000 par value of the stock of the Equitable Life Insurance Society. His direct income from this investment was limited by law to less than one-eighth of one per cent. a year; but it gave legal control of $504,000,000 of assets. It was wealth which enabled the Morgan associates to buy, from the Equitable and the Mutual Life Insurance Company the stocks in the several banking institutions, which, merged in the Bankers' Trust Company and the Guaranty Trust Company, gave them control of $357,000,000 deposits. It was wealth which enabled Mr. Morgan to acquire his shares in the First National and National City banks, worth $21,000,000, through which he cemented the triple alliance with those institutions. Now, how has this great wealth been accumulated? Some of it was natural accretion. Some of it is due to special opportunities for investment wisely availed of. Some of it is due to the vast extent of the bankers' operations. Then power breeds wealth as wealth breeds power. But a main cause of these large fortunes is the huge tolls taken by those who control the avenues to capital and to investors. There has been exacted as toll literally "all that the traffic will bear." The Pujo Committee was unfortunately prevented by lack of time from presenting to the country the evidence covering the amounts taken by the investment bankers as promoters' fees, underwriting commissions and profits. Nothing could have demonstrated so clearly the power exercised by the bankers, as a schedule showing the aggregate of these taxes levied within recent years. It would be well worth while now to reopen the Money Trust investigation merely to collect these data. But earlier investigations have disclosed some illuminating, though sporadic facts. The syndicate which promoted the Steel Trust, took, as compensation for a few weeks' work, securities yielding $62,500,000 in cash; and of this, J. P. Morgan & Co. received for their services, as Syndicate Managers, $12,500,000, besides their share, as syndicate subscribers, in the remaining $50,000,000. The Morgan syndicate took for promoting the Tube Trust $20,000,000 common stock out of a total issue of $80,000,000 stock (preferred and common). Nor were monster commissions limited to trust promotions. More recently, bankers' syndicates have, in many instances, received for floating preferred stocks of recapitalized industrial concerns, one-third of all common stock issued, besides a considerable sum in cash. And for the sale of preferred stock of well established manufacturing concerns, cash commissions (or profits) of from 7 1/2 to 10 per cent. of the cash raised are often exacted. On bonds of high-class industrial concerns, bankers' commissions (or profits) of from 5 to 10 points have been common. Nor have these heavy charges been confined to industrial concerns. Even railroad securities, supposedly of high grade, have been subjected to like burdens. At a time when the New Haven's credit was still unimpaired, J. P. Morgan & Co. took the New York, Westchester & Boston Railway first mortgage bonds, guaranteed by the New Haven at 92 1/2; and they were marketed at 96 1/4. They took the Portland Terminal Company bonds, guaranteed by the Maine Central Railroad—a corporation of unquestionable credit—at about 88, and these were marketed at 92. A large part of these underwriting commissions is taken by the great banking houses, not for their services in selling the bonds, nor in assuming risks, but for securing others to sell the bonds and incur risks. Thus when the Interboro Railway—a most prosperous corporation—financed its recent $170,000,000 bond issue, J. P. Morgan & Co. received a 3 per cent. commission, that is, $5,100,000, practically for arranging that others should underwrite and sell the bonds. The aggregate commissions or profits so taken by leading banking houses can only be conjectured, as the full amount of their transactions has not been disclosed, and the rate of commission or profit varies very widely. But the Pujo Committee has supplied some interesting data bearing upon the subject: Counting the issues of securities of interstate corporations only, J. P. Morgan & Co. directly procured the public marketing alone or in conjunction with others during the years 1902-1912, of $1,950,000,000. What the average commission or profit taken by J. P. Morgan & Co. was we do not know; but we do know that every one per cent. on that sum yields $19,500,000. Yet even that huge aggregate of $1,950,000,000 includes only a part of the securities on which commissions or profits were paid. It does not include any issue of an intrastate corporation. It does not include any securities privately marketed. It does not include any government, state or municipal bonds. It is to exactions such as these that the wealth of the investment banker is in large part due. And since this wealth is an important factor in the creation of the power exercised by the Money Trust, we must endeavor to put an end to this improper wealth getting, as well as to improper combination. The Money Trust is so powerful and so firmly entrenched, that each of the sources of its undue power must be effectually stopped, if we would attain the New Freedom. How Shall Excessive Charges Be Stopped? The Pujo Committee recommends, as a remedy for such excessive charges, that interstate corporations be prohibited from entering into any agreements creating a sole fiscal agent to dispose of their security issues; that the issue of the securities of interstate railroads be placed under the supervision of the Interstate Commerce Commission; and that their securities should be disposed of only upon public or private competitive bids, or under regulations to be prescribed by the Commission with full powers of investigation that will discover and punish combinations which prevent competition in bidding. Some of the state public-service commissions now exercise such power; and it may possibly be wise to confer this power upon the interstate commission, although the recommendation of the Hadley Railroad Securities Commission are to the contrary. But the official regulation as proposed by the Pujo Committee would be confined to railroad corporations; and the new security issues of other corporations listed on the New York Stock Exchange have aggregated in the last five years $4,525,404,025, which is more than either the railroad or the municipal issues. Publicity offers, however, another and even more promising remedy: a method of regulating bankers' charges which would apply automatically to railroad, public-service and industrial corporations alike. The question may be asked: Why have these excessive charges been submitted to? 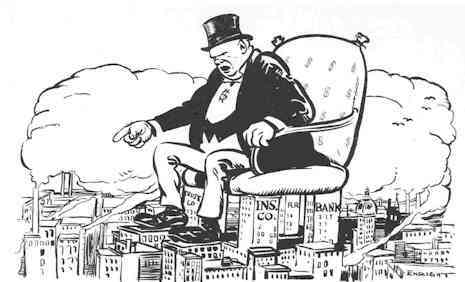 Corporations, which in the first instance bear the charges for capital, have, doubtless, submitted because of banker-control; exercised directly through interlocking directorates, or kindred relations, and indirectly through combinations among bankers to suppress competition. But why have the investors submitted, since ultimately all these charges are borne by the investors, except so far as corporations succeed in shifting the burden upon the community? The large army of small investors, constituting a substantial majority of all security buyers, are entirely free from banker control. Their submission is undoubtedly due, in part, to the fact that the bankers control the avenues to recognizedly safe investments almost as fully as they do the avenues to capital. But the investor's servility is due partly, also, to his ignorance of the facts. Is it not probable that, if each investor knew the extent to which the security he buys from the banker is diluted by excessive underwritings, commissions and profits, there would be a strike of capital against these unjust exactions? "The long series of rebuffs to new loans at the hands of investors reached a climax in the ill success of the great Rothschild issue. It will remain a topic of financial discussion for many days, and many in the city are expressing the opinion that it may have a revolutionary effect upon the present system of loan issuing and underwriting. The question being discussed is that the public have become loth to subscribe for stock which they believe the underwriters can afford, by reason of the commission they receive, to sell subsequently at a lower price than the issue price, and that the Stock Exchange has begun to realize the public's attitude. The public sees in the underwriter not so much one who insures that the loan shall be subscribed in return for its commission as a middleman, who, as it were, has an opportunity of obtaining stock at a lower price than the public in order that he may pass it off at a profit subsequently. They prefer not to subscribe, but to await an opportunity of dividing that profit. They feel that if, when these issues were made, the stock were offered them at a more attractive price, there would be less need to pay the underwriters so high commissions. It is another practical protest, if indirect, against the existence of the middleman, which protest is one of the features of present-day finance." Compel bankers when issuing securities to make public the commissions or profits they are receiving. Let every circular letter, prospectus or advertisement of a bond or stock show clearly what the banker received for his middleman-services, and what the bonds and stocks net the issuing corporation. That is knowledge to which both the existing security holder and the prospective purchaser is fairly entitled. If the bankers' compensation is reasonable, considering the skill and risk involved, there can be no objection to making it known. If it is not reasonable, the investor will "strike," as investors seem to have done recently in England. Such disclosures of bankers' commissions or profits is demanded also for another reason: It will aid the investor in judging of the safety of the investment. In the marketing of securities there are two classes of risks: One is the risk whether the banker (or the corporation) will find ready purchasers for the bonds or stock at the issue price; the other whether the investor will get a good article. The maker of the security and the banker are interested chiefly in getting it sold at the issue price. The investor is interested chiefly in buying a good article. The small investor relies almost exclusively upon the banker for his knowledge and judgment as to the quality of the security; and it is this which makes his relation to the banker one of confidence. But at present, the investment banker occupies a position inconsistent with that relation. The bankers' compensation should, of course, vary according to the riskheassumes. Where there is a large risk that the bonds or stock will not be promptly sold at the issue price, the underwriting commission (that is the insurance premium) should be correspondingly large. But the banker ought not to be paid more for gettinginvestorsto assume a larger risk. In practice the banker gets the higher commission for underwriting the weaker security, on the ground that his own risk is greater. And the weaker the security, the greater is the banker's incentive to induce his customers to relieve him. Now the law should not undertake (except incidentally in connection with railroads and public-service corporations) to fix bankers' profits. And it should not seek to prevent investors from making bad bargains. But it is now recognized in the simplest merchandising, that there should be full disclosures. The archaic doctrine ofcaveat emptoris vanishing. The law has begun to require publicity in aid of fair dealing. The Federal Pure Food Law does not guarantee quality or prices; but it helps the buyer to judge of quality by requiring disclosure of ingredients. Among the most important facts to be learned for determining the real value of a security is the amount of water it contains. And any excessive amount paid to the banker for marketing a security is water. Require a full disclosure to the investor of the amount of commissions and profits paid; and not only will investors be put on their guard, but bankers' compensation will tend to adjust itself automatically to what is fair and reasonable. Excessive commissions—this form of unjustly acquired wealth—will in large part cease. But the disclosure must be real. And it must be a disclosure to the investor. It will not suffice to require merely the filing of a statement of facts with the Commissioner of Corporations or with a score of other officials, federal and state. That would be almost as ineffective as if the Pure Food Law required a manufacturer merely to deposit with the Department a statement of ingredients, instead of requiring the label to tell the story. Nor would the filing of a full statement with the Stock Exchange, if incorporated, as provided by the Pujo Committee bill, be adequate. To be effective, knowledge of the facts must be actually brought home to the investor, and this can best be done by requiring the facts to be stated in good, large type in every notice, circular, letter and advertisement inviting the investor to purchase. Compliance with this requirement should also be obligatory, and not something which the investor could waive. For the whole public is interested in putting an end to the bankers' exactions. England undertook, years ago, to protect its investors against the wiles of promoters, by requiring a somewhat similar disclosure; but the British act failed, in large measure of its purpose, partly because under it the statement of facts was filed only with a public official, and partly because the investor could waive the provision. And the British statute has now been changed in the latter respect. The required publicity should also include a disclosure of all participants in an underwriting. It is a common incident of underwriting that no member of the syndicate shall sell at less than the syndicate price for a definite period, unless the syndicate is sooner dissolved. In other words, the bankers make by agreement, an artificial price. Often the agreement is probably illegal under the Sherman Anti-Trust Law. This price maintenance is, however, not necessarily objectionable. It may be entirely consistent with the general welfare, if the facts are made known. But disclosure should include a list of those participating in the underwriting so that the public may not be misled. The investor should know whether his adviser is disinterested. Not long ago a member of a leading banking house was undertaking to justify a commission taken by his firm for floating a now favorite preferred stock of a manufacturing concern. The bankers took for their services $250,000 in cash, besides one-third of the common stock, amounting to about $2,000,000. "Of course," he said, "that would have been too much if we could have kept it all for ourselves; but we couldn’t. We had to divide up a large part. There were fifty-seven participants. Why, we had even to give $10,000 of stock to ———— (naming the president of a leading bank in the city where the business was located). He might some day have been asked what he thought of the stock. If he had shrugged his shoulders and said he didn't know, we might have lost many a customer for the stock. We had to give him $10,000 of the stock to teach him not to shrug his shoulders." We have today secured substantial control of the successful machinery business heretofore conducted by ——— at ———, Illinois, which has been incorporated under the name of the Excelsior Manufacturing Company with a capital of $10,000,000, of which $5,000,000 is Preferred and $5,000,000 Common. As we have a large clientele of confiding customers, we were able to secure from the owners an agreement for marketing the Preferred stock—we to fix a price which shall net the owners in cash $95 a share. Were such notices common, the investment bankers would "be worthy of their hire," for only reasonable compensation would ordinarily be taken. For marketing the preferred stock, as in the case of Excelsior Manufacturing Co. referred to above, investment bankers were doubtless essential, and as middlemen they performed a useful service. But they used their strong position to make an excessive charge. There are, however, many cases where the banker's services can be altogether dispensed with; and where that is possible he should be eliminated, not only for economy's sake, but to break up financial concentration.